Two more fighters from Guardians make their debut in the latest preview post. In the one corner we have Mauler, a literally unstoppable fighter who drags his opponents to his location and then beats them. In the other corner is Paladin, the ultimate team player. He buffs his teammates’ damage, shields them, and re-readies them for another action. The tactical differences between team compositions will be significant. From Fabio Lopiano (Calimala) and Capstone Games comes Ragusa, a game about building the city that today is known as Dubrovnik. Ragusa is a worker placement game. Your workers are houses, but that doesn’t change the mechanism. What is different is that each house you place doesn’t just give you one action, it gives you all three actions surrounding its space. Out in the countryside that means you gather resources, in the city your options are mote diverse. The second special ingredient to the mix is how houses reactivate adjacent houses, your own as well as your opponents’. That keeps everyone involved at all times and adds a lot of depth to your decisions. We’ve already talked about Friedemann Friese’s fresh Fast Forward frolic Fatal, only by its English title Fortune. A slot machine card game for high score hunters. But there’s more coming from 2F-Spiele. 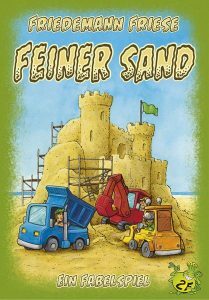 First, we have Feiner Sand / Fine Sand, another game that uses the Fable idea of getting you into the game without reading rules first. Fine Sand is a deck unbuilding game. Each player has a stack of cards representing material for their sand castle. The goal is to use all your materials and build a magnificent sand castle before everybody else. The Fable concept will give you a long chain of changing games to enjoy, and if you can’t find people to play there’s a solo campaign included. Foppen is not a new game, but the edition from 1995 has been a bit of a pain to find recently. It’s a trick-taking game where taking tricks by playing the highest card is not your main objective. What you really want is to never play the lowest card, because then you have to skip the next round. In a game you win by playing your final card before the other players, that’s not good. the English edition of Foppen will be titled Fool!. Finally, there’s Futuropia. This is a game many have been waiting for, an economic game with no element of luck in the fine tradition of Friese’s Power Grid. Futuropia lets you build a habitat for the near fuThere’s a significant difference between the spread of a disease and the invasion of a barbarian tribe. Barbarians don’t just pop in your city with no prior warning. For Pandemic: Fall of Rome that means the rules for placing cubes needed some adjustment. You don’t just place them in a city any longer, the barbarians move from their home territory towards the city they aim to invade. Cubes will be more predictable in where they appear. That’s important because, unlike regular Pandemic, you don’t remove cubes from the board. You place your own to prevent getting them. #boardgame #pandemic #fallofromest workers. The fewer people still have to work in your design, the better. I’m always excited about new Friedemann Friese games, but this one has me more impatient to try it than all his games since The First Sparks. English editions of all games will be available from Stronghold Games. There’s a significant difference between the spread of a disease and the invasion of a barbarian tribe. Barbarians don’t just pop in your city with no prior warning. For Pandemic: Fall of Rome that means the rules for placing cubes needed some adjustment. You don’t just place them in a city any longer, the barbarians move from their home territory towards the city they aim to invade. Cubes will be more predictable in where they appear. That’s important because, unlike regular Pandemic, you don’t remove cubes from the board. You place your own to prevent getting them. Pandemic: Fall of Rome is not the only new cooperative game coming from Z-Man Games. Narabi is going to be a more relaxed affair. Together the players make a nice, tidy stone garden with the stone cards in numeric order. However, the stones have restrictions how they may be swapped. Stones and restrictions are mixed into card sleeves before each game, so you won’t know what a stone’s restrictions are, and only the owner of the card is allowed to check. I still haven’t made up my mind about Arkham Horror Third Edition. Everything about it looks more streamlined, a development I’d usually applaud but feel strangely ambivalent about in this case. Take the Mythos Phase, for instance. Many things can still happen, most of them bad for you. However, almost everything that can happen is now dictated by the scenario you play, just the timing and and location is random. Don’t get me wrong, I think it sounds like a great cooperative game, but I’m going to miss those Arkham Horror games where you randomly can’t move fast because the city is covered in ice for most of the game and then there’s a sudden outburst of paranoia at the university and you almost stop caring about Cthulhu’s approach because you have more immediate problems. Third Edition is going to be a very different experience. KeyForge‘s world of Crucible is home to all kinds of creatures. Even demons. The demonic House of Dis is who you call on when you need greed and destruction. When they are not killing you they’re probably stealing your hard-earned Aether. Or turning your freshly forged key back into the Aether it was made from and then stealing that. Lovely people. I’m a programmer in my day job. Games about programming, or even better games where you program, have a special appeal to me. Scott Almes’s Lovelace & Babbage, on Kickstarter from Artana, is right up my alley. The programs you make are simple, you choose registers that modify your number with basic arithmetics. You try to hit the target numbers to score wealthy patrons for points and to score subroutine cards for special effects. Doesn’t sound hard? You do it under time pressure. While everyone else executes their programs on the same computer. 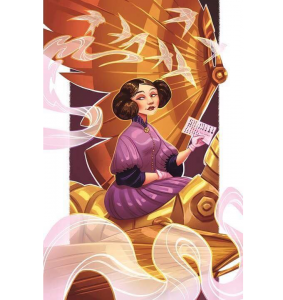 That the game highlights some of my personal idols like Ada Lovelace and Charles Babbage is an awesome bonus I didn’t even need to make me drool. Oleksandr Nevskiy is one of the designers of Mysterium, and that makes him a big name for games where you communicate in images. His new game Detective Club uses image cards again but is otherwise quite different from Mysterium. Detective Club is about finding a single word the active player comes up with, and all but one of the other players know the word already. That one clueless player has to pretend he knows the word when playing image card to match it. The other players have to figure out who the clueless player is. If the idea reminds you of Spyfall then that already makes two of us. Spyfall meets Mysterium, this has to be my favorite crossover since Doctor Who and Torchwood routinely swapped characters. A game by Michael Schacht (Zooloretto, Mondo, too many more to count,…) is a big debut for publisher Maple Games. Dragon Boats of the Four Seas is another Michael Schacht game that you won’t want to pass on. First it makes you bid on goods that will become offerings to the great dragons. With their blessing you will send your meeples up into the mountains or across the sea where they’ll claim territories for your house’s end game score. Nothing about Dragon Boats of the Four Seas is super complex, but everything about it is inviting and clever, starting from the mechanism to gain more starting resources in return for getting your final bidding disk later in the game. If that’s the type of game Maple Games will publish they’ll earn a shelf in my collection. The first Kickstarter by Creative Games Studio is a quick, clever dice drafting game called The Towers of Arkhanos. As members of different magic schools players rebuild the titular towers. They do so together, but that’s out of necessity. Each of them wants to have the most power in the tower when a floor is completed. To contribute to a tower a dice of the correct color and value is needed. You might try to be clever and contribute to a tower that no one will be able to finish with the remaining dice. You’re forgetting one important thing, though. The other players are wizards as well, and wizards cheat. It takes a turn to prepare the various spells that let you manipulate the dice, but having them at the right time will make all the difference. Hokkaido is a sequel to map building game Honshu. Again you will build a landscape from cards, aiming to score high. There are many parallels between the two games, but Hokkaido brings new ideas to the table. We don’t know much yet about what those will be, but they include card drafting. eggertspiele will publish a new Alexander Pfister game. 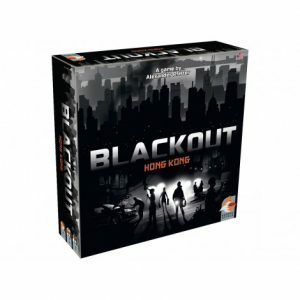 In Black Out – Hong Kong the disaster mentioned in the title has happened. The city with more than seven million inhabitants is without power. It falls to the players to salvage what resources they can and build a network of specialists to keep the city going and prevent the collapse of society. Sounds easy enough, right? Even if you’re not a fan of Catan – yes, apparently those people exist – the new scenario box that will debut in Essen might be of interest. Catan Scenario – Crop Trust is not just another scenario. The semi-cooperative expansion is about crop conservation. When you harvest you’ll always want to store some seeds in a safe place to ensure sufficient food supply in case of disasters. Fail to plan for the future and all players may lose the game together in a rather horrible way. Involved in the development and benefiting from the profits is the Global Crop Diversity Trust, one of the key players in maintaining the Svalbard Global Seed Vault and other genebanks around the world. So you get a new Catan scenario and you help an important and fascinating project for the future of humanity. There’s absolutely nothing not to like. There’s a new mini expansion to make you play Scythe again. As if you ever stopped. Nevertheless, Scythe Encounters will be a fun addition to Stonemaier Games’s amazingly popular strategy game. The deck of 32 new encounter cards was curated by Jamey Stegmaier, but every card was first suggested by Scythe’s fan community. This week’s featured photo shows a mountain gorilla in Bwindi Impenetrable National Park, Uganda. The park is one of only two remaining retreats for the critically endangered species. I’m glad we still have a chance to see them. The photo was taken by Jason Houston for USAID and is in the public domain.